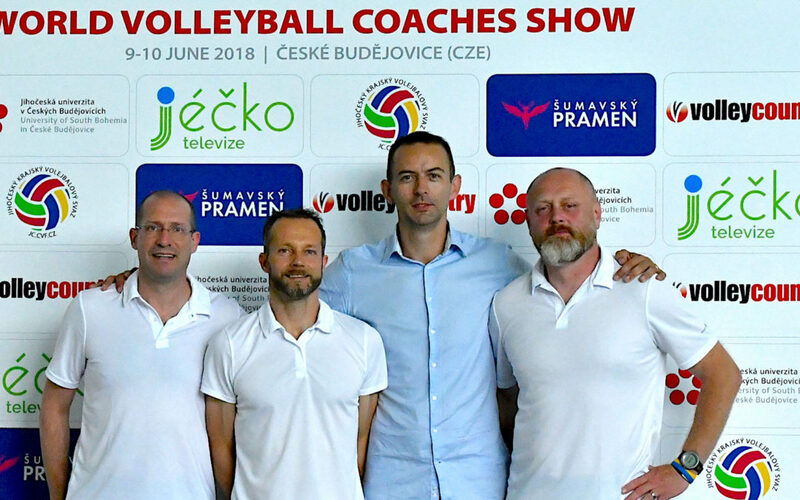 World Volleyball Coaches Show took place in June 9 – 10 in Ceske Budejovice (Czech Republic). This unique volleyball conference offered 12 hours of volleyball in many topics and practical examples. Coaches presented their opinions and experiences in two hours blocks. Every block was concluded by questions from public. On Saturday’s evening organisers prepared after party where all coaches discussed volleyball in more casual ways with Budweiser Budvar beer. Conference guests came from Czech top volleyball teams, journalists from Europe as Bartek Wenceslav – owner of Siatka.org. Show attended coach with gold medal from 2017 ECH U18 Jiri Zach. Czech television made short clip from show and all VIP attendees received access to all video recordings. Every attendee also received certificate of participation. “The speakers were great, showing the best from them. I am very happy to see so many coaches interested in volleyball. This is why we organised volleyball conference World Volleyball Coaches Show and it encourages us to work harder and bring even better event next year. I can not forget about our media partners, so thanks to Worldofvolley, Siatka and others”, says Jiri Popelka, VolleyCountry.com owner.